Prince of Persia has been heavily hyped as being the next Pirates of the Caribbean . . .
After all, it is the latest Disney / Jerry Bruckheimer offering and promises high adventure and romance in pre-Islamic Persia (Iran). Whereas Pirates was based on a popular theme-park ride, Prince of Persia is based on a computer game which has been around since the days of the XT. Movies are collaborative efforts – something we often tend to forget when swooning over this or that actor or director. However in the case of the first Pirates movie it is astounding what a difference Johnny Depp’s eccentric performance (reputedly inspired by the Rolling Stones’ Keith Richards) made. When they saw the first dailies the Disney suits thought he was taking the piss, but Depp stuck to his guns and his star comedic turn elevated the material and made Pirates into the popular blockbuster it was. Prince of Persia is desperately in need of a Johnny Depp. Donnie Darko star Jake Gyllenhaal may have the rugged good looks in the title role to woo female viewers, but his performance is stilted and stiff. The same goes doubly for his onscreen romantic interest, Gemma Arterton, who seems to confuse royal demeanor with wooden performance. Things only begin to pick up in the acting department with the appearance of Alfred Molina as a tax-averse rogue “entrepreneur”. It may be a slight role, but Molina again steals the show as he did as Doc Ock in Spider-man 2 several years ago. Set in “the mystical lands of Persia”, as the marketing material informs us, the plot involves a rogue prince (Gyllenhaal) who is framed for the murder of his adoptive father, the king. Teaming up with a princess (Arterton) he must not only avoid capture and clear his name, but also prevent a dagger with magical powers that turn back time from falling into the hands of the real killer, namely the king’s brother (played by Ben Kingsley). No plot spoilers there by the way: you know Kingsley is the chief villain the very moment you see him. By the way, Kingsley dupes the Persians into conquering a peaceful city for supposedly producing weapons for their enemies. Sound familiar? The romantic sparks are supposed to fly between the lead couple, but it is not to be. Gyllenhaal and Arterton are no Han Solo and Princess Leia no matter how much banter the screenwriters throw into the mix. "Some muscled youth beating up on Gandhi doesn't exactly make for an exciting movie climax!" 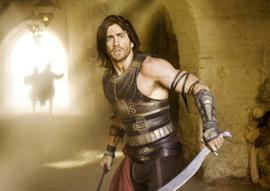 And that is the problem with Prince of Persia: we have seen so much better movies in the past. Watching it I couldn’t help but be reminded of Raiders of the Lost Ark (because of the setting) and District 13 (because of the parkour stunts which have Gyllenhaal running from rooftop to rooftop just like his computer game equivalent). But whereas Raiders of the Lost Ark only had one scimitar-wielding turbaned baddie, Prince of Persia has dozens of them. Yet, it is nowhere as exciting as the 1981 Spielberg movie. The problem lies in the action sequences, which like the movie itself is a case of wasted opportunities. Watching some muscled youth beat up on Gandhi doesn’t exactly make for an exciting movie climax you know. Another scene promises to be the first ostrich chase sequence in movie history, but the movie does absolutely nothing with it. Like his videogame avatar Gyllenhaal’s character performs all kinds of almost superhuman stunts without breaking a sweat. But that is precisely the problem: “game over” seems a long off. The best action movies know that the best way to inject tension into action sequences is to make their heroes vulnerable. Indiana Jones beaten bloody by a bald Nazi thug. Bruce Willis having to walk bare feet across a floor covered in glass shards. Prince of Persia’s release date was pushed back from 2009 for almost a year. Director Mike Newell (Harry Potter and the Goblet of Fire, Four Weddings and a Funeral) seems to have spent all that time in the editing room, editing Prince of Persia to bits. On the one hand the movie (in particular the action scenes) are over-edited in the way directors do when they are afraid that audiences might be bored by onscreen events. On the other hand, the movie seems to be put together almost haphazardly with random slow-motion scenes of horse-riding baddies occasionally just thrown in for the heck of it. The movie has no real flow, particularly in its mid-section. It is all noise and spectacle and should be an exhausting experience in IMAX. It is a tale told by an idiot full of sound and fury signifying nothing as the man said. Then again, it is a Jerry Bruckheimer movie (practically a genre all by itself) . . . Still, Disney may have thrown $200 million plus at Prince of Persia but it doesn’t seem to have helped at all! Read our Prince of Hollywood: Jerry Bruckheimer Interview: "I always find it funny when you hear an American actor speaking in a period film with an American accent saying things like 'that's cool'. It just doesn't work. So we thought a British accent was the way to go!"